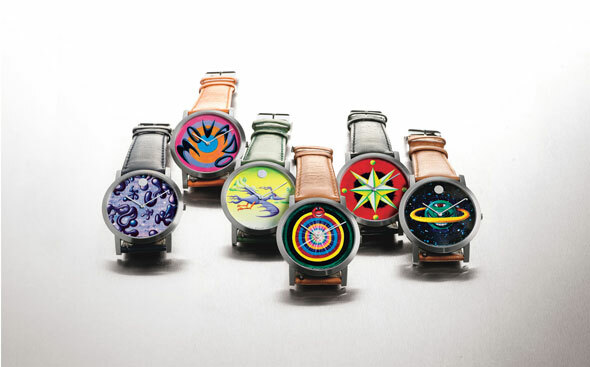 Movado’s newest Artist Series Collection is a line of watches by graphic artist, Kenny Scharf. Kenny’s mind holds quirky, colorful interpretations of timekeeping, and he masterfully displays those thoughts on the dials of Movado’s Artist Series watches. Movado has a long history of working with renowned artists, to produce interesting creations. There was even a time when Movado collaborated with pop art icon Andy Warhol. The Kenny Scharf Artists Series Collection is made up of six uniquely styled pieces. Each of the watches has a different graphic depiction. All of the Kenny Scharf watches are beautiful in a unique and interesting way. The collector’s edition timepieces are all Movado Swiss quartz movements, and all accurate and created with the craftsmanship which has made Movado famous. The pieces are numbered and are produced in sets of 125 each. The Artists Series watches are presented in a specialty box, and feature two interchangeable straps, each. These watches are in high demand, and hard to find. Since the closing of some of Movado’s specialty boutiques, they have been almost impossible to track down, but there is hope. The Movado boutique at Rockefeller Center in New York has all of the Artists Series watch in stock, except for the “Time Flies” watch. Call them to reserve your special piece of Movado history, soon.